Is your facility following the rules of the road for MRI safety? On January 27, 32-year-old Rajesh Maru went to a hospital in Mumbai, India, to visit an elderly relative and walked into an MRI room while holding an oxygen cylinder. The cylinder was immediately sucked into the MRI machine, and Maru died from injuries sustained in the accident. The person in charge of room safety, who was apparently unaware that MRI magnets are always on, had assured Maru and his family that the machine was turned off. There are many steps that could and should have been taken that would have prevented Maru's tragic death. Although people often assume that MRI is safe because it doesn't use ionizing radiation to produce images, this accident and others like it demonstrate that MRI demands proper precaution. Tobias Gilk, MRSO, MRSE, MRSC, M. Arch, a radiology and MRI consultant and chairman of the board of directors at the American Board of Magnetic Resonance Safety (ABMRS), says the emphasis on safety measures related to radiation and a lack of emphasis on MRI safety has led to a skewed perception about MRI among members of the public and some health care professionals. "Ionizing radiation has a [stochastic] certainty of patient injury, but that certainty of patient injury is statistically incredibly small for any individual. And, within diagnostic radiology, the risk of manifestation of that injury is typically time-delayed by decades before the genetic damage that results in the development of a cancer crops up. The fact is, barring egregious mishaps in diagnostic use, when ionizing radiation harms patients, what that means is that their lifetime risk of cancer, for example, goes up a few percentage points. That's a horrific ionizing radiation accident," Gilk says. "When we talk about accidents in the MR environment, we talk about instantaneous second-, third-, even—rarely—fourth-degree burns resulting in amputation. We talk about the accident that happened in India." Emanuel Kanal, MD, FACR, FISMRM, MRMD, MRSE, a professor of radiology and neuroradiology and director of MR services in the department of radiology of the University of Pittsburgh Medical Center Health System, says part of the problem is that MRI is much more difficult to understand than X-ray-based modalities. "Explaining X-ray risks takes a minute, literally," Kanal says. "Starting to explain what the potential safety problems are with MR imaging—and why—can take 15 minutes." According to Kanal, who chaired the ACR's MR Safe Practice Guidelines committee from its inception in 2001 until 2012 and is also the founder and original chairman of the board of the ABMRS, the strength and spatial distribution of these energies over the human body and their associated risks are unique to each type of energy. As opposed to X-rays or other types of radiation, the safety risks associated with these energies can be found in regions that are quite distant from the anatomy that is being imaged. In fact, some of the MR-related patient risks can be found even in tissues that are not directly being irradiated with that energy. "People don't intuitively understand that," says Kanal. "The physics is not what they're used to. It takes days to get them comfortable with understanding all of these different energies that are used in the MR imaging process, how they work, what patient safety risks they generate and why, and where in the patient these risks are found for each type of energy." Compounding the problem, Gilk says, is that many health care facilities associate accreditation, such as The Joint Commission or ACR safety accreditation, with having a working MRI safety protocol. Although accreditations and credentials do demonstrate safety throughout the enterprise, when it comes to MRI safety, they haven't historically provided concrete, prescriptive preventions to address the most common types of MRI accidents and injuries. He sees this mindset as a significant barrier. "The most universal area where sites can use improvement is the pervasive notion that The Joint Commission or ACR accreditation is proof, in and of itself, that they have a safe operation from an MR safety point of view, when, in fact, the accreditation regimes speak almost nothing to MR safety-specific accident preventions," Gilk says. A lack of defined procedures as well as a lack of MR safety education on the part of onsite MR practitioners are the primary reasons for most MR-related injuries, Kanal says. By systematically reviewing MR suite procedures, accidents can be avoided. He believes medicine can draw on experience from another industry to reduce patient risk. "Aviation teaches us that when something bad happens, it's usually not a result of a single error. Rather, it's usually because of multiple steps that led from one thing to another, and the weakest link is what breaks the chain," Kanal says. "So, if at any point you can do something that would stop that chain of events, then you would not necessarily proceed to a catastrophic outcome." Gilk says the three most common MR injuries, excluding contrast reactions, are burns, projectile injuries, and hearing damage. He adds that there are steps that can drastically reduce the incidence of each of these types of injuries. The steps have to be clearly defined, however. In two-thirds of the hearing damage injury cases in the FDA's Manufacturer and User Facility Device Experience database, Gilk says, the imaging sites offered hearing protection to their patients. The problem seems to be that they didn't ensure that the hearing protection was used correctly. "There's a protocol to making sure that the hearing protection is placed correctly," Gilk says. "If the site doesn't work with the patient to make sure that the hearing protection is correctly positioned or that it's actually performing the way we want it to perform, then simply giving the patient a package of neon orange foam plugs doesn't provide any insurance that the patient is actually getting the hearing protection." Burns are another concern. "RF [radiofrequency] burns do not all seem to result from a single mechanism," Kanal explains. "This has not been widely recognized or acknowledged throughout the MR industry, which is one of the reasons why RF burns continue to occur with such frequency. After all, if the MR practitioner does not recognize how or why an RF burn can occur, how can we expect to stop them from happening?" Kanal says some MR-related burn injuries result from patient tissue being permitted to get too close to the walls of the MR scanner—and the RF transmitter that is right behind it—during scanning, so-called proximity burns. Other burns result from loops of RF-induced current that cause patient tissues with regions of high electrical resistance, such as fat, to heat up. Resonant circuitry induced burns are a relatively esoteric safety concern in MRI that are closely related to this type of induced current loop. Reflected RF power into patient tissues from aluminized drug delivery patches or mylar blankets are yet another. "Each of these types of MR-related thermal injury risks has clear, well-identified means of prevention, but steps taken to prevent one type of burn from occurring may do nothing to ameliorate the risk of another type of MR-related burn," Kanal says. "This is why a solid understanding of the underlying MR-related risks and mechanisms is so important in MRI-related patient care." Projectile injuries are also a significant risk. These occur because ferromagnetic materials get too close to the magnet, as was the case with Maru. Gilk says anyone entering the MRI control room, known as zone 3, or the MRI room itself, known as zone 4, needs to be thoroughly screened, and objects that are at risk of becoming projectiles need to be clearly labeled. By following standardized protocols for patient screening, he estimates that 97% of burn injuries and 94% of projectile accidents can be eliminated. "None of these things are rocket science. None of these things are particularly difficult to implement. And we know that they are profoundly effective," Gilk says. "So we have protections for burns, and we have protections for projectile-related accidents, but none of these are explicitly required under The Joint Commission accreditation, for example, or ACR accreditation, for example." There seems to be a clear need for more and better MRI safety education. In 2015, the ABMRS formed to provide credentialing for three positions that it deems essential to every MR department: MR medical director (MRMD), MR safety expert (MRSE), and MR safety officer (MRSO). Individuals who attain an ABMRS credential have demonstrated knowledge of effective MRI safety procedures. A consensus document published in 2016 by the International Society for Magnetic Resonance in Medicine in the Journal of Magnetic Resonance Imaging also identified MRMD, MRSE, and MRSO as necessary staff. "If you're not specifically trained and educated in the safety of MRI, then you should not be overseeing safety in the MR environment," Kanal says. "In fact, if you're not specifically trained in MR safety, you're not 'MR personnel' per se. You shouldn't be allowed in the MR environment without being accompanied and supervised by somebody who is." Kanal, who created his own courses dedicated entirely to MR safety, says there has been strong interest all over the world. He has taught courses in Europe, Scandinavia, Australia, and the Middle East, as well as North America, and he says the average attendance is between 150 and 300 people. The courses take place over three days and cover 24 lecture hours. Since June of 2014, Kanal estimates that more than 4,500 people have attended, and additional courses are booked worldwide through late 2019. Also, as reported in the November issue of Radiology Today, he has recently released MagnetVision, an app that allows MR personnel to visually see how MRI energy fields affect specific patients, customized to the patient's medical history, body habitus, anatomy being scanned, and specific implant/foreign body as well as the specific make, model, and type of MRI scanner and scanner hardware/coils that are being used. Those who have tried the app have been extremely enthusiastic about its ability to assess, visualize, and quantify the risks associated with scanning patients in whom there are devices, implants, and/or foreign bodies. 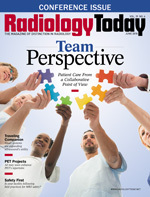 "All patients should be screened with a prescreening at the time of scheduling; a screening tool at the time of arrival at the facility where the technologist asks them a series of questions, records their answers, and investigates a little further when answers don't seem to match the story; and then that screening process should be confirmed with whole-body ferromagnetic detection systems," says John Posh, MR safety officer, director of education for Metrasens. The ferromagnetic detectors are necessary because patients aren't always the most reliable reporters of their medical histories, whether due to age, infirmity, or simple forgetfulness. The ferromagnetic detectors also serve as early and late warning systems for patients and personnel in the MRI areas. Typically, a screener will be mounted in zone 2, the patient dressing area, and an entry control system will be installed on the outside of the zone 4 door, Posh says. He does not recommend handheld detectors because he believes that they are not reliable. Having trained personnel on duty at all times is essential, Posh says. A comprehensive policy and procedure manual is also required, he adds. The manual may differ for each facility, but it requires diligence on the part of stakeholders to make it effective. "A policy and procedure manual is not a single event. It's a living, breathing document. It has to meet the needs of the facility and allow the facility to clearly define their ways of working, yet it has to also allow them enough flexibility so that when they need to, for patient care reasons, they can deviate," Posh says. "So, in crafting that document, there's generally a committee that's in charge of things like that, although I would venture that very few people start a policy and procedure manual from scratch. What they do is adapt from others. The best policy and procedure manuals that I've seen have had involvement from the medical director of MRI, technologists, and the policy committee, which should include representatives from nursing and administration." A facilitywide effort is needed because adequate MR safety has often been assumed but not verified, Gilk says. He says personnel need explicit training and a clear mandate to effectively enforce MR safety. Shining a light on this need can prevent serious injury or death. "In MR, thankfully, accidents are extraordinarily rare, but if we have an accident, we might kill somebody, then and there," Gilk says. "I think there is an enormous disconnect between our risk assessment in response to radiation as compared to our risk assessment and response to MR-related risks."